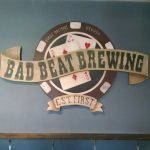 Bad Beat Brewing, located on Eastgate Rd. in Henderson, started out in 2014 with Gutshot, an Irish Stout. They have a barrel aging program that started out with 1 bourbon barrel and has expanded to 4 chardonnay barrels, 4 whiskey barrels, and 8 bourbon barrels. We got our samples and weren’t disappointed with any of them. We were lucky enough to be there as they tapped a brand new brew, Little Guy Rye, an unfiltered weizen using malted rye instead on wheat. Delicious enough for me to get the full 16oz serving. 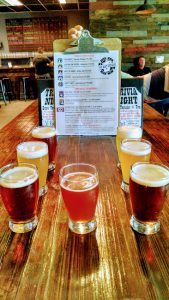 In the taproom you will find a Nintendo system to play, darts, shuffleboard and board games.